Monday; I was scanning the map for an interesting hike in the nearby regions, and it took a while because I’ve done quite a few hikes in the nearby regions over the past decade. But then I suddenly noticed a route that had passed me by – a path from Homborset to Homborsetsætra. 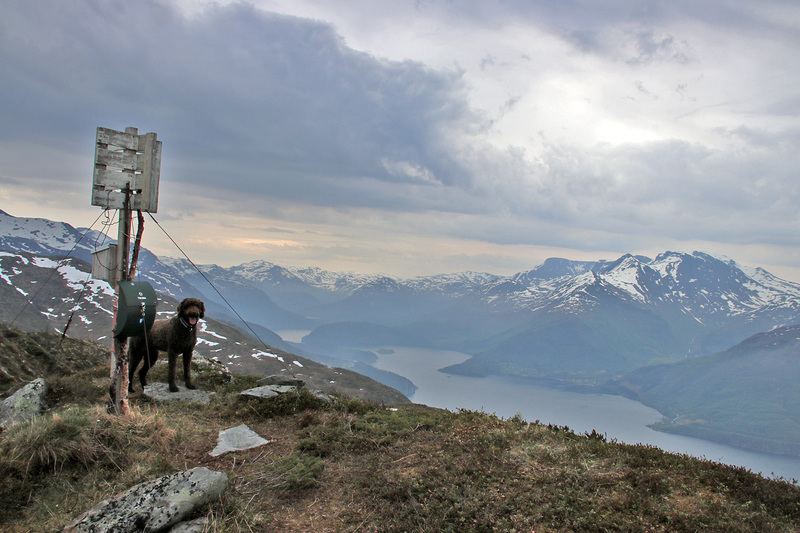 A closer study revealed that a round trip hike was possible – descent via Vassteinsætra. Hmm… very interesting! I parked at Homborset, just outside the south entrance to the Rotsetunnelen tunnel – near the village Volda. I quickly located the path thanks to a signpost. The path climbed steeply for a while and I remember thinking that this would be heaven for those who love lactic acid. 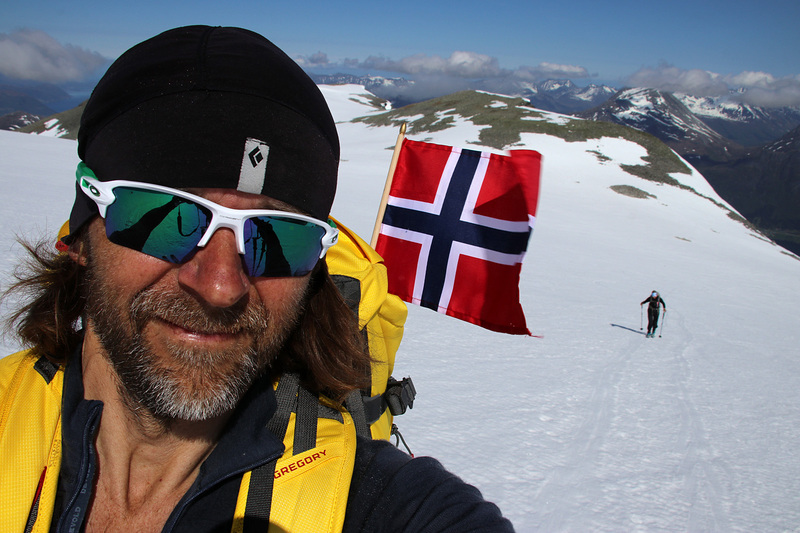 After a while, the climb got less steep and we kept a steady northwest course to Homborsetsætra (460m). 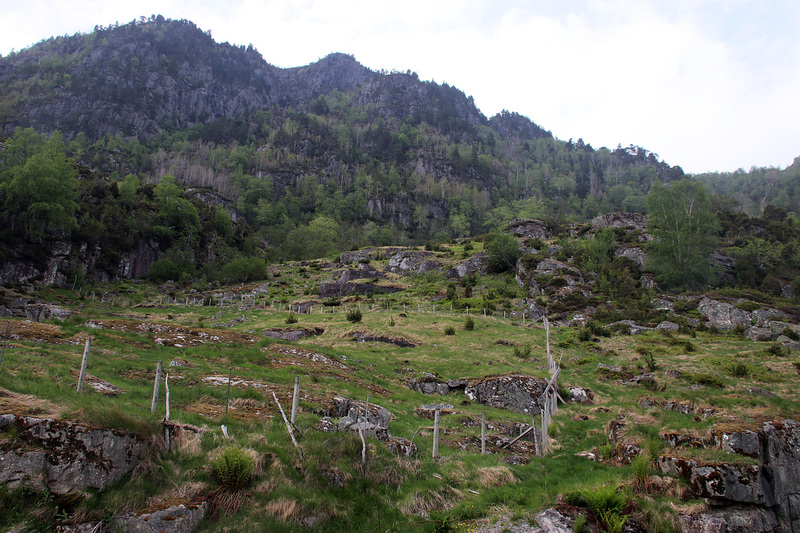 I missed out on the path from Homborsetsætra to Skaret – the pass between Heidane and Hornet, but found some kind of track that was OK to follow. We arrived the top of Hornet one hour after leaving the car. 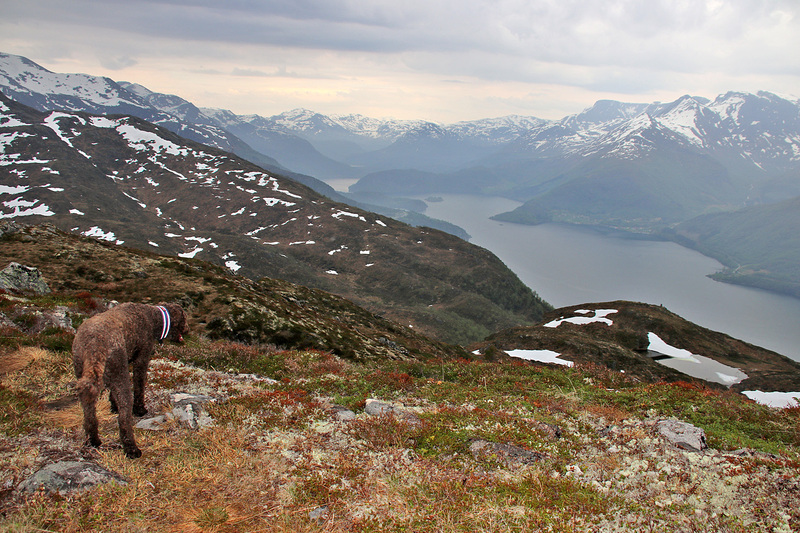 From Hornet, we followed the path down to the pass towards Skarphornet, where we headed off-trail south until we met the path from Vassteinsætra. Initially, the path followed the creek southbound, but after the while the path moved away from the creek. It wasn’t difficult to understand that this was because of steep cliffs and waterfalls. At approx. 240m, the path crossed the creek and I followed it down to Vassteinen. From here, I had only 0,6km back to the car at Homborset. I really, really enjoyed this round trip hike, from the beginning to the end. I look forward to show this route to my girlfriend Anne. 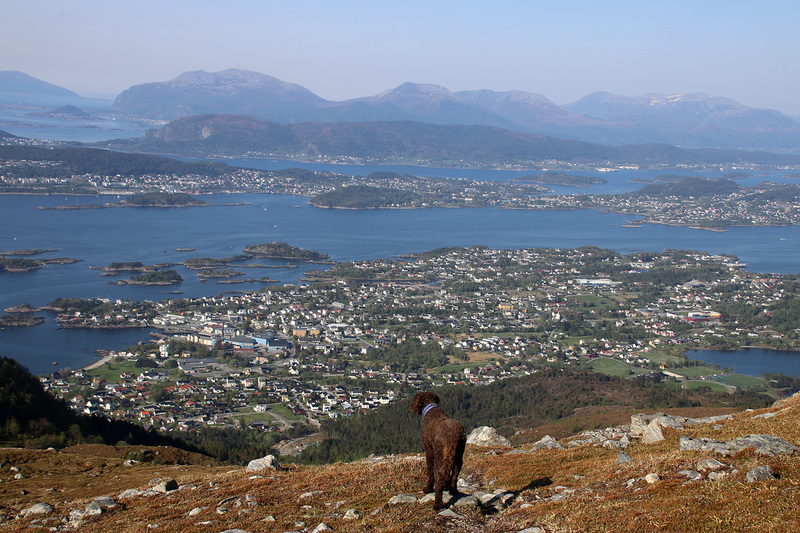 Tuesday; working day in Ålesund and stunning weather. 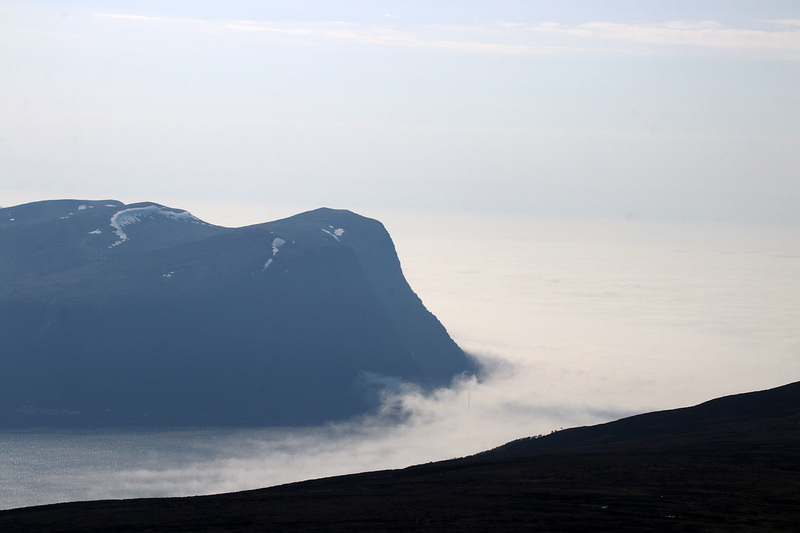 I did however not feel very inventive in terms of hiking and settled for Sulafjellet – a mountain I know inside and out. 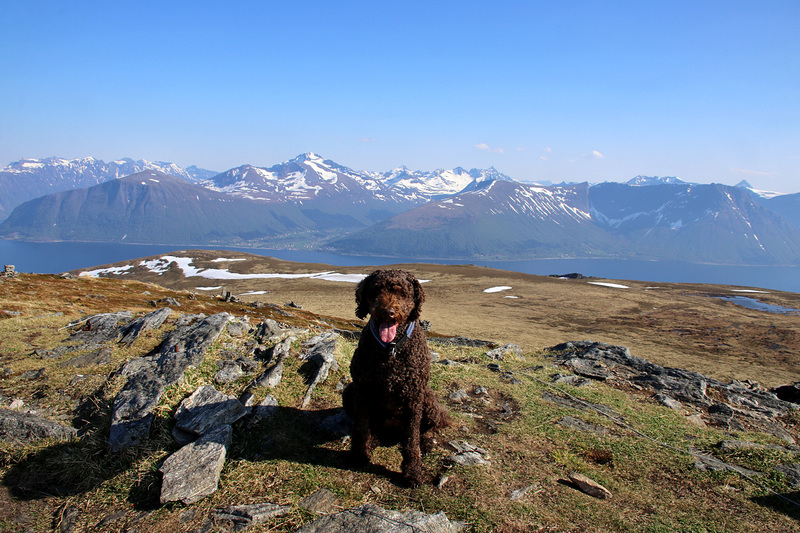 We (Karma and I) started out in Langevågen and followed the (less used) path along the Steinelva creek until we reached the mountain road near Vonhytta. 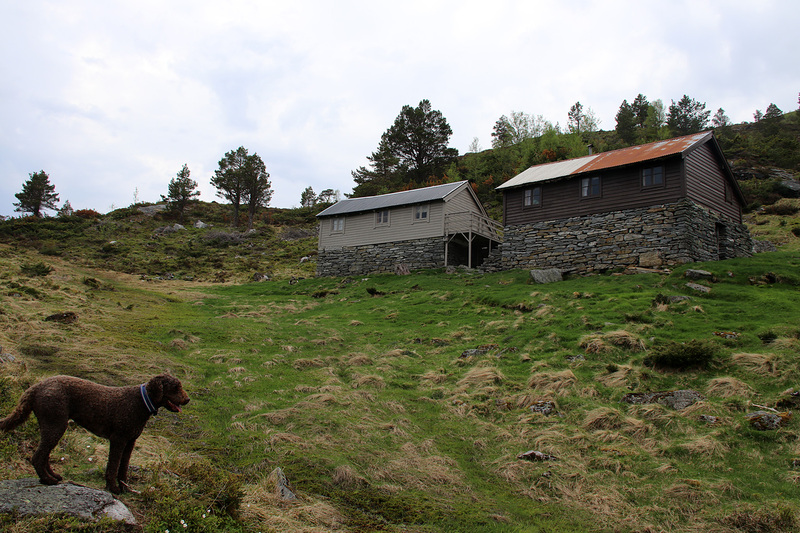 From here, we headed off-trail directly up to Grøthornet (650m). 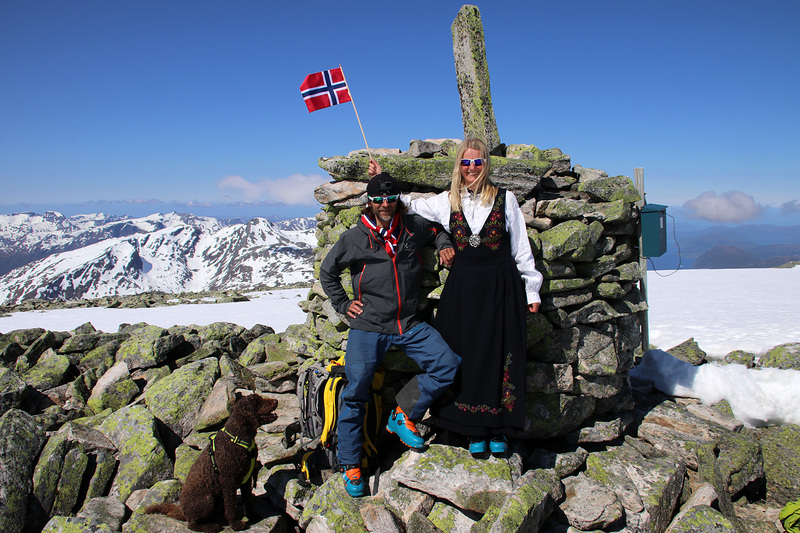 Next stop was the high point on this massif – Vardane. I didn’t follow the normal path, as it would lead me to snow that was a little too steep and slippery for my hiking shoes. We arrived on the summit ridge from the west and could soon enjoy the beautiful views from this top. Wednesday; Garnestua is a top I visit quite often, but today I decided to do a variant I’d never done before. 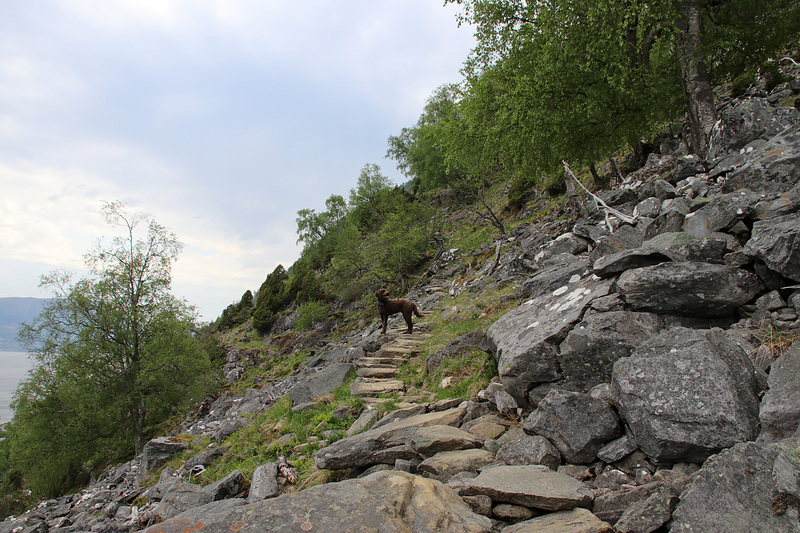 Karma and I started out from the roundabout in Garneskrysset and followed the path up to Garnesvatnet and then up to Flåna. Then we continued to the top of Garnestua. So far – a well known route. The trip: 7,9km 740 vertical meters, 1h:27m. Thursday; the Norwegian National day, and Anne had arrived the night before – only to travel on the next day. But there was enough time for a memorable ski-trip where Anne could take on her national costume on top. The choice fell on Eidskyrkja. I’ve been up there around 10 times before, Anne once. 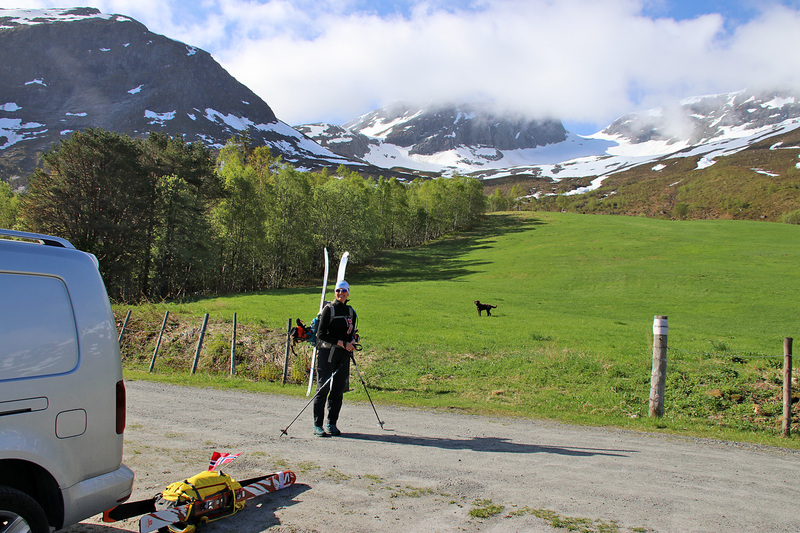 We drove up to the Skinnviksætra parking (350m) and hoped that we wouldn’t have to carry the skis for a very long time. We only had to walk 0,7km before there was enough snow to warrant skiing. We were definitely not alone up here. Not on a National day! 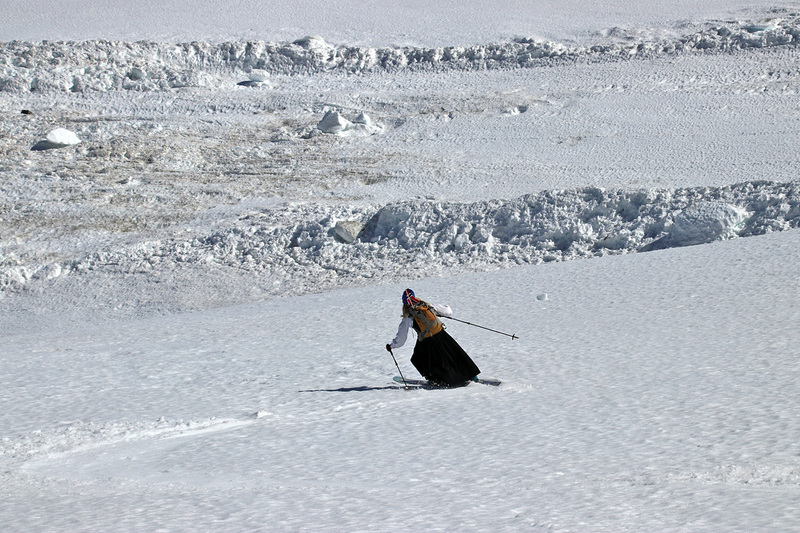 After a little while, we had to carry the skis over a section without snow, but from here on, snow was guaranteed. 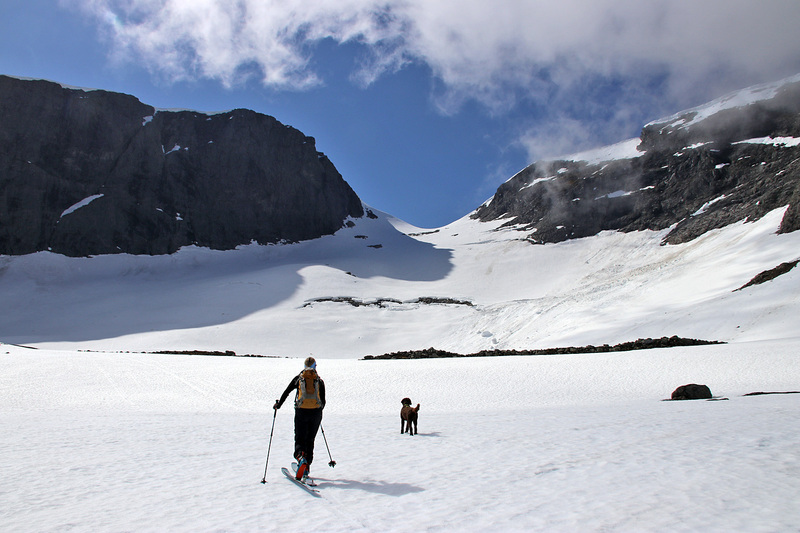 This route involves crossing a small glacier. Most people call it a glacier. I’m not so sure it is. I think of it as “permanent snow”. 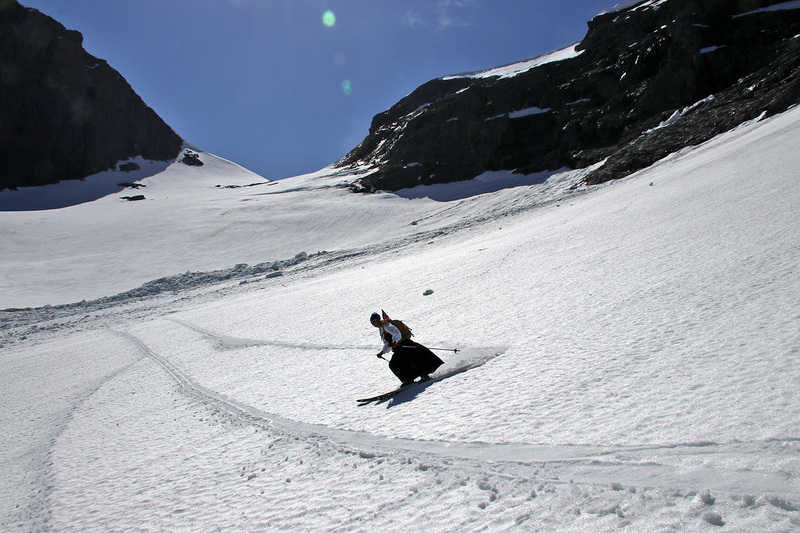 But Kollefjellet makes sure that the sun seldom shines on the glacier, hence the snow can be quite hard. So we decided to stay in the middle – further right – of the glacier, which potentially exposed us to ice fall from the walls to our right. But it also gave us softer snow – and a grip. It’s steep enough to slide for a while in case you fall. Once the steep section was over, the remaining part to the top was just a stroll. It took us 2,5 hours to get to the top, taking it easy all the way. 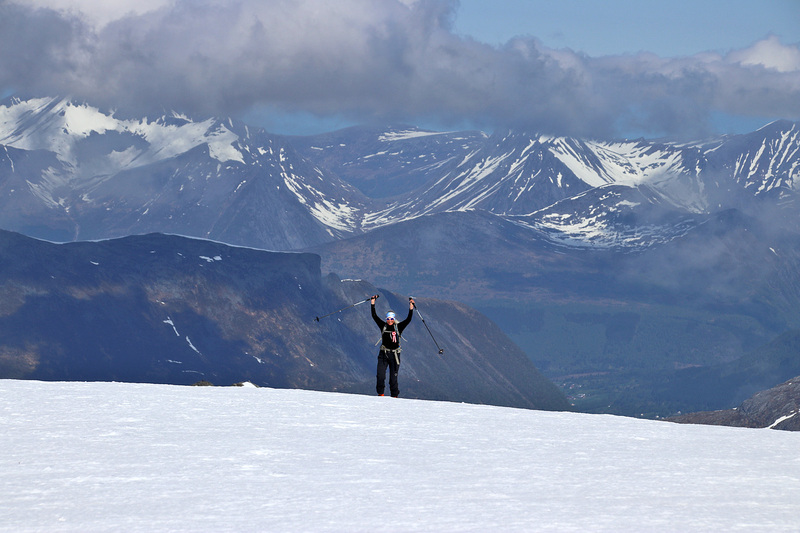 When I ski this mountain alone, I enjoy “pushing it” and it takes me 1h:20-25m to ascend the ~1150 vertical meters. After a nice stay on top, we were ready for the dessert – the descent. Due to some fumbling with the GoPro, Anne and Karma were already on their way down. This stressed me a bit and I must have been sloppy when putting the skis on. I hadn’t skied for long when one ski suddenly left my foot and I slam-dunked into the hard snow. My arm took the worst beating and it took a while to recover. Slightly reduced, I carried on. The descent wasn’t really enjoyable, for three reasons. 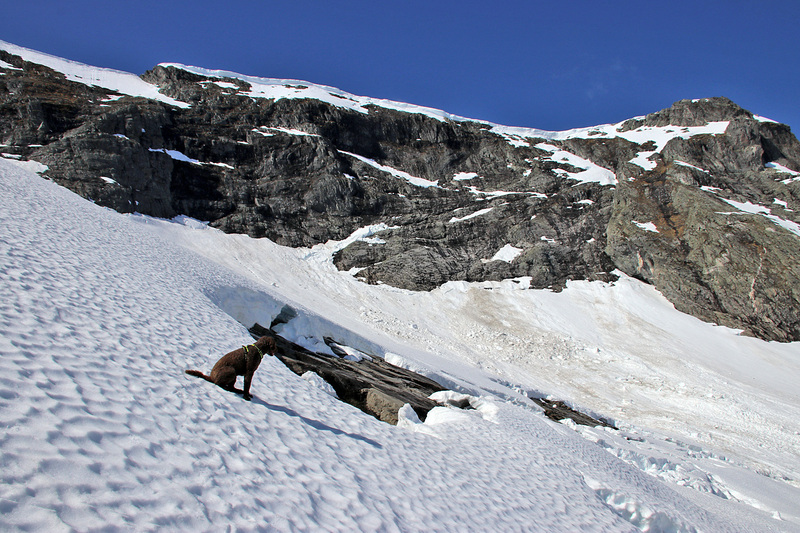 1) my arm, 2) the hard snow on the glacier and 3) Karma – who keeps running towards our skis all the time. But once past the glacier, we picked up the normal routine. One of us is holding Karma while the other gets to enjoy the skiing. Then we take turns. And just before we ran out of snow, I had my turn. That was very, very enjoyable. It was altogether a nice way to spend the National Day. But eventually it was time to get back home and get Anne off to the airport. Here’s a video I put together. It contains the pictures below plus video clips from the descent. The trip: 10,8km 1145 vertical meters, 4h:05m. Friday; the purpose of my trip to the local tops Rjåhornet and Nonshornet was to scout out a route between the two tops that we the local hiking group (where I am a “field operative”) has planned to mark. 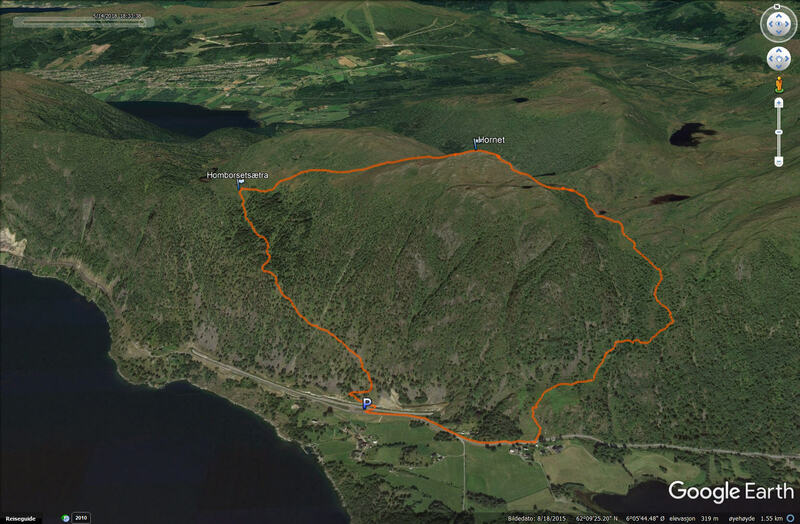 I started from Stemmedalen, took the newest route up to Rjåhornet and continued towards Nonshornet while making my mind up on where the new route should go. 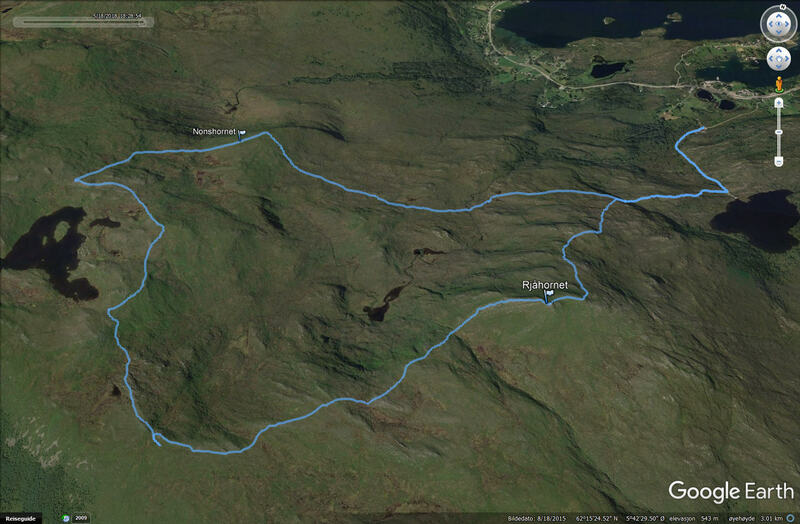 Now that the snow had melted, the choice of route was fairly obvious. Once marked, it will be a nice route. 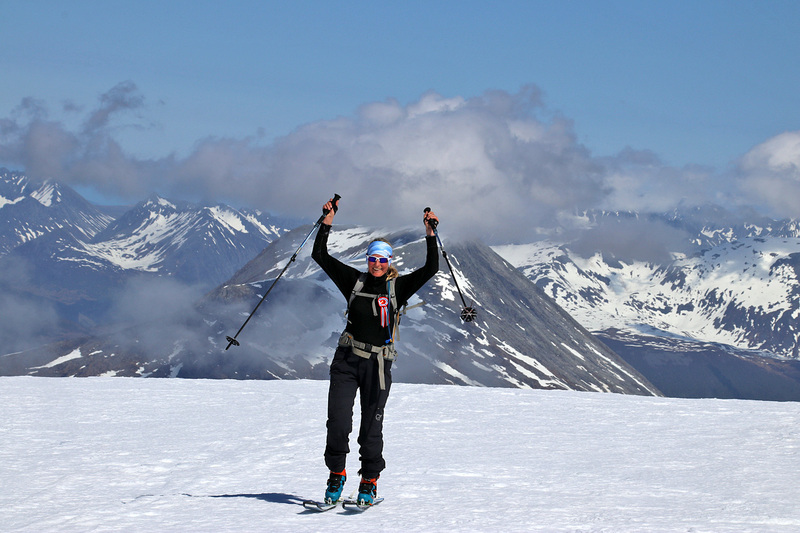 From Nonshornet, I crossed Høgsetdalen to rejoin the Rjåhornet route to Stemmedalen. On my way across the valley, Karma sought towards a small pond. I took her off her leash in case she wanted to enter it. Which she did. And then something truly amazing happened. Karma went crazy in the pond and out jumped something that I’m pretty sure was an otter. 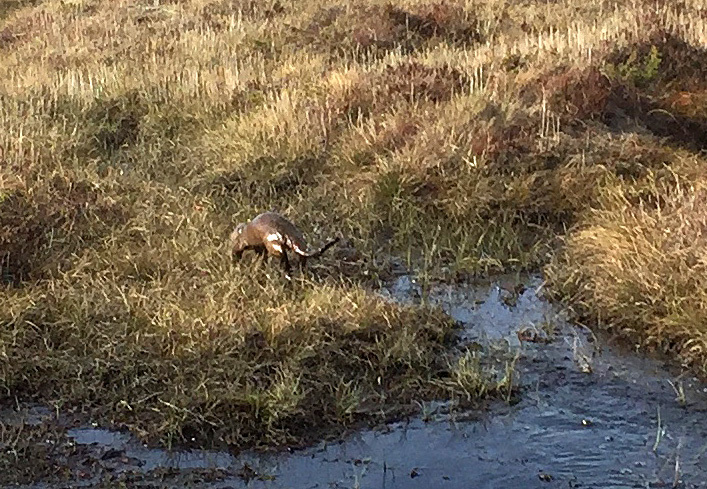 I did NOT expect to find an otter in the mountains. Along the fjord, yes, but not up here. Either way, it seemed that the otter got away unharmed to tell the story. It would have been really bad if Karma had harmed the animal. The trip: 11,8km 780 vertical meters, 2h:22m.